Design: Curved mouthpiece with high ported center barrel and a square twist. The Myler MB 43HP offers a "comfort zone" when the horse is relaxed at the poll. With independent side movement, the MB 43HP works well for lifting a shoulder, bending collection and stopping. It is a good choice for spoiled horses and those needing encouragement to relax at the poll or lift a shoulder. 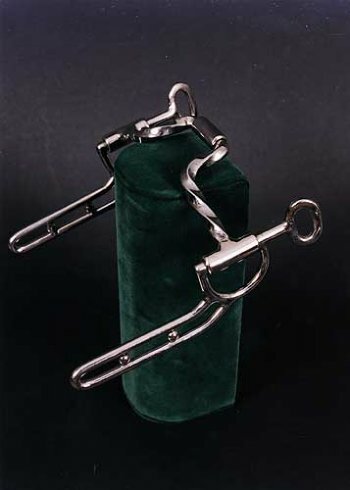 The square twist gives the bit more bite to get the attention of a harder mouthed horse. Works well on horses that turn their head to one side and are starting to get hard to hold or maybe putting their tongues over the bit. Also available without bushing.